Today marks the start of the last week of the first three months of this job. Most jobs, at least for me, require about this much time just to get the lay of the land – tools, process, people, expectations, etc. I am still wildly in love with this job and I am finding that what once was perceived as being handled with kid gloves or being dealt with at arm’s length is the fact that my little team is enourmously busy. I guess I know now why they hired me in to do the work singularly with the journals project. Nothing could be better, (well, I suppose the commute could be shorter) but I couldn’t ask for anything more. I have a great boss, my teammates are supportive and responsive, my project group is awesome and the company is truly exciting. Medicine is one of those fields that you don’t have to worry about things slowing down or the need will disappear, this is something that will always be on the cutting edge of technology. The paycheck is more than I could have hoped for! Last week my check was an unexpected bonus, as there are five Fridays in October, so one whole check was not budgeted. And after the belt-tightenig that we’ve been doing, this windfall was fantastic. I was able to go out and almost with abandoned buy exactly what I needed – er, rather, what I wanted (which is mostly what I need). Like, replacing the television in my sewing room with a new flatscreen and moving the AppleTV to it, and replacing the streaming device for the main television with Roku and signed up for Amazon Prime. Didn’t bat an eyelid. Way cool! I am trying to not be stupid when it comes to purchases, though, and of course, paid myself first. And spent a fair amount restocking the kitchen cabinets (which were getting a bit bare) and freezer. My grocery bill was almost double the usual. But of course, I still used my grocery store card and coupons. Hey, all of it matters! I am sure that I have mentioned this in the past, but I grew up in a kind of a crazy family… there were ten of us kids, although only 8 lived to adulthood. But around my “tween” years, I shared the house with 5 brothers and 1 (baby) sister and we NEVER had enough of anything. It was the kind of household where you’d regularly run out of shampoo and have to use dish soap to wash your hair, be using the bathroom and run out of toilet paper (run out in the HOUSE not just in the room) and someone would hand you a box of kleenex (if we were lucky) or roll of paper towels (always expensive) but there were times when you were handed rags. That was awful. I have this favorite story I tell about socks. Most people don’t give much thought to socks as kids, but because of sheer number of socks my mom washed, she wouldn’t sit and pair them and identify socks as belonging to a specific person. Instead, she would scoop the socks out of the dryer into a basket and everyone got their own socks from there. 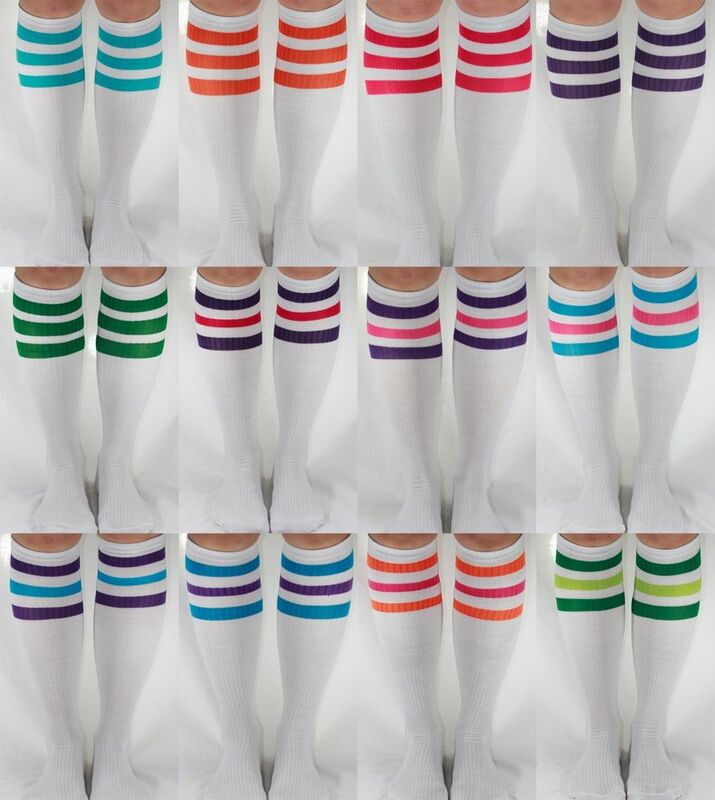 The socks were all the same, those horrible cheap tube socks without heels and would wear through very quickly. The majority of them always required mending, again, something not done on any regular basis, so there were maybe ten pairs of “good” socks when they came out of the dryer. For some reason, I was never able to get down to the laundry room to collect “my” socks – probably too busy taking care of “the baby”, but for whatever reason, I always ended up with socks with holes in the toes or heels or they actually had been darned and the seam was under your foot. Wearing them would result, inevitably, in seriously discomfort and perhaps even a blister. So when I moved away from home, the first thing I did was to buy 75 pairs of socks that I vowed to never darn or mend and they would be thrown away when they were too thin or worn through. I still do that to this day. I throw away tons of socks that most people would find acceptable. Not me. My motto is, I never run out of anything and I never wear anything torn, mended or worn out. Neither does my son. It is what I learned growing up poor. So this past weekend also included on a socks and underwear run for me and The Kid. Of course, I never do anything in moderation, so we’re good and stocked up for any pending apocalypse! So, the week is half over and I am outta here. What a great day! Roadside Signs… Better Than a “Slow” Warning! Last weekend when we went urban exploring, we happened onto this series of road signs. 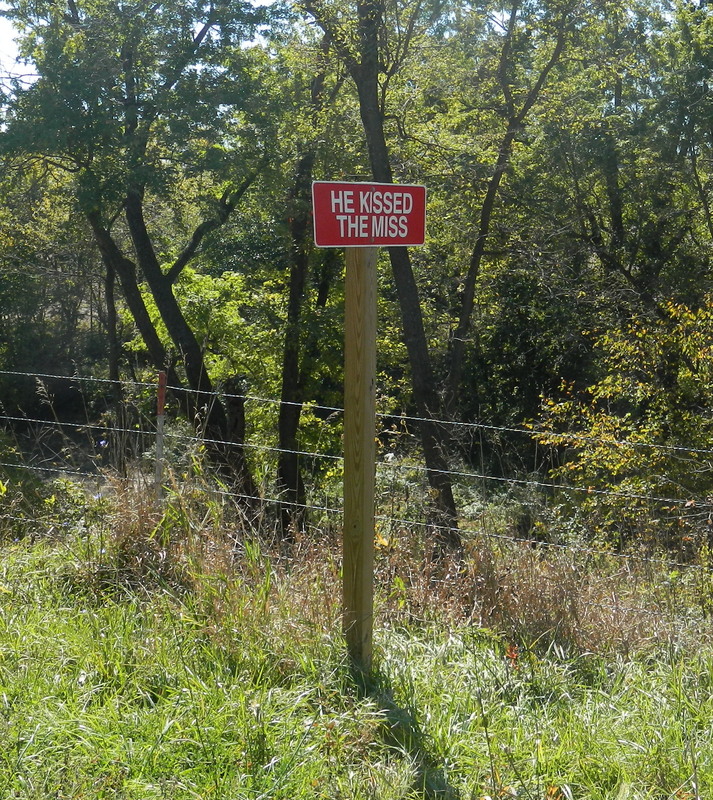 I love that someone felt that they had to post these, they were quality produced but on some gravel road out in the middle of BFE Iowa. This was just too funny not to post. I guess it was their way of getting people to slow down – I know we did! Who knew Iowans could be so funny! 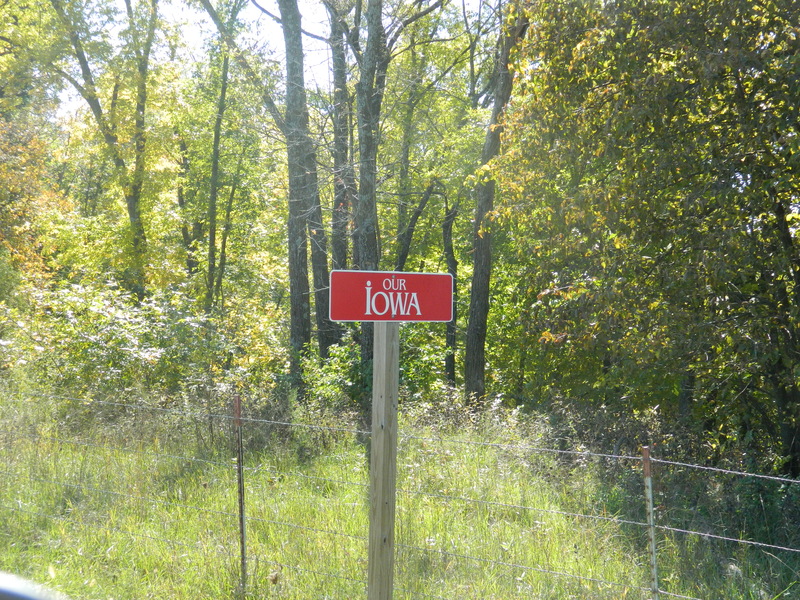 This past weekend, it seemed a good time to cruise the Iowa countryside and do some urban exploration. I was hoping to maybe do some geocaching at the same time, but we didn’t get around to figuring out how to get started, so it was all abandoned house hunting. We decided to leave on Friday when I got home from work rather than waiting until Saturday morning. The plan was to hopefully hit one or two houses on the way north and then stay somewhere overnight and then head into central to south central part of Iowa the next day and if it was going well, stay somewhere on Saturday night and head home on Sunday. Not sure what it is, but some combination of not sleeping in your own bed and doing a lot of driving and doing a fair amount of walking and climbing can wear a body out. Especially if we’re a tad “middle aged”. But even the Kid got worn out, so it wasn’t just me. The sun set quicker than we expected but we still managed to find a house or two Friday evening. And out there, IT WAS DARK! Stumbling around a vacant home and yard (and sometimes barns) can be tough with just flashlights. Even if they are really really good flashlights! The best part was that it was fairly easy to figure out which homes where abandoned (once you located ’em) because the houses and yards were dark. No lights. And if you are familiar with farms, you know that one being occupied has lighting in the yard (and usually some in the house). But it was tough stumbling around the first one and in the back of my mind (I being the MOTHER after all) kept thinking about all the things that could go wrong. So we opted to just find a place to sleep for the night and get an early start in the morning. Well, unaware we had almost made our way to Des Moines, so I chose a nice hotel downtown. I’ve never spent much time in Des Moines, considering that I have a brother and his family that live there. But thanks heavens for Google maps. We checked into a 4 star hotel and promptly I passed out. The Kid, being a younger soul stayed up a bit later, but I am sure that with a snoring mom and white noise, it lulled him to sleep promptly too. Next morning, we headed south and west. We criss-crossed down country roads, dirt roads, gravel roads and ‘barely roads’. For a while it seemed that we weren’t going to have any luck, but all it seemed to take was the first house. Then we found about a dozen. Many of the houses had been abandoned for some time, and we had to tread carefully as to not end up on the floor below us! We took a lot of great photos. And at this point I will let the photos do the talking. We were both quite worn out, so at the end of the day, we simply pointed the truck south and before we knew it we were back in Kansas City. I am pretty proud of myself that I figured out how to add this photo carousel. I am thinking that there are many more tricks that I still need to learn here. Enough for tonight though. Hope you enjoyed it. What Did I Do Right With That Kid? If you’ve been reading this blog (or the other one) you know that I am an over-proud parent of a son. I refer to him in the blogs as “The Kid” such as he is not big for social media and I really do not care to inundate the internet with his name. He has a unique name and once unleashed on the world, it probably would be most difficult to retrieve. Anyway, The Kid is now 19 and has for the past 20 years (19 years and the 9 months I was pregnant with him) have been the source of the most inspirational, joyous and intense happiness for me. He is beyond the perfect kid, even during his teenage years, never going through that angst-y phase and never giving me much issue. There was that one issue with a cell phone and me buzz cutting his shoulder-length hair – but even we can laugh about that now. He never fails to amaze me. The thing is, in all seriousness, is that he still doesn’t know what he wants to do with his life. The direction that I took in raising him, was to do everything exactly the opposite that my mom did with me. And it has not only resulted in a happy and healthy kid, but it has given me immense pleasure in the mere fact that he is my son. This weekend, he totally took me by surprise by cooking Sunday dinner. He has recently – about the last four or five years – begun to develop a healthy interest in different foods than he grew up eating. Remember, I was a child of a midwestern typical family that ate meat and potatoes for every meal. This weekend, out of the blue (and after having maintained an inherent dislike of all foods Chinese), he opted to make fried rice on his own. Now, most people don’t think that is a big deal, but let me tell you, this Kid always needs to put his mark on whatever he makes – and he has been recently becoming quite the baker. I have never been a fan of fried rice, always opting for sticky steamed white rice. Well, let me tell you, this was heaven! I suppose the added benefit of having someone else shop, prep, cook, serve and cleanup didn’t hurt – but this was unlike anything I’ve ever eaten, he definitely kicked it up a notch with his “secret ingredient”. This is bound to be a staple for some time in our household. He has now asked for a wok, and I have found one in the line of cookery that I have invested in. In fact, the brand of pots and pans that I found when I first got married – Magnalite – is no longer manufactured, so to find a unique piece like a wok in unused condition is pretty much a miracle. It will soon join the extensive collection that I already have. We’re back at Monday. Again. So on to the day!